2018 sees the 150th anniversary at the All England Lawn Tennis & Croquet Club- now more famous for the Wimbledon Tennis Championship. Any croquet player of course is aware that the club started out as a Croquet Club before evolving into the Tennis Championship. The club is having a exhibition of its 150 years at the museum, including a section on croquet titled 'Through the Hoops: croquet at Wimbledon'. The exhibition runs from the 22nd of March 2018 to the 3rd of February 2019. 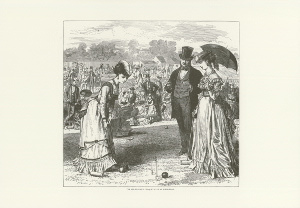 Here at the shop we list some historic prints including a interesting one of croquet at the All England Club. Originally published in 1870 by The London Illustrated News this print is at £6.00 including delivery. We are looking out on lawns covered by snow and next week the Cheltenham Club lawns are closed for maintenance. So, unfortunately, although the shop is open customers will not be able to try out our mallets on the lawns. Lawns will be open, dependent on weather from the 12th March. The Croquet Association is pleased to announce the appointment of Mark Suter as the CA Manager who will take up his appointment on 26th February 2018. He succeeds Liz Larsson who is leaving us after almost 10 years of loyal and dedicated service. He has spent 25 years abroad as a Business and Marketing Consultant in the Finance sector working from Cape Town and Dublin for 10 and 15 years respectively. Mark has enjoyed a long involvement with Croquet and is a top ranked player of both Association and Golf Croquet. As a teenage member of Bristol Croquet Club in the nineteen-eighties he was among the top ranks of Association Croquet players. Since his return to England he began his comeback to the tournament circuit in early 2017 as a member of the Nailsea and Cheltenham clubs. His 2017 season culminated with winning the Chairman's Salver. We would like to wish a very happy new year for our customers at the Croquet Association. We are well aware that a bit of cold weather (frost permitting!) does not stop a hardy croquet player in the winter months. At the shop we can offer a wide range of fleeces, pullover jumpers and reversible gillets to help keep you warm through the winter. These can be found in the Croquet clothing section of the shop. Please note that the shop will be closed on Christmas Day and Boxing Day Bank Holidays, opening again on Wednesday the 27th of December. Although the shop will be open to take orders and queries, any deliveries would not be sent until after the New Year on Tuesday the 2nd of January 2018. We would like to wish all our customers a merry Christmas and a happy New Year. The seasonal rush is well under way and as usual deliveries are subject to delays but we will do everything we can to ensure you orders are delivered on time. 20th December for UK postcodes.